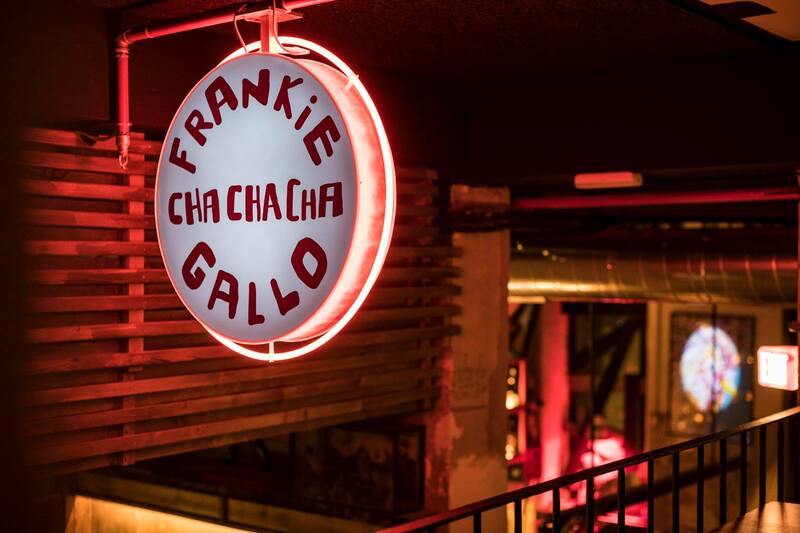 Frankie Gallo Cha Cha Cha has been hailed as one of the best places for pizza in Barcelona. A bold claim you might think, in a city with nearly 27,000 Italian residents, yet this pizzeria is undoubtedly a prime contender for this exceptional accolade. Experience for yourself their extremely attentive staff, cavernous industrial-style restaurant and rich, diverse menu just off La Rambla, and decide if they are worthy of their reputation. Another remarkable aspect of the eatery, Frankie Gallo Cha Cha Cha has two very Tardis-like qualities. Firstly, from the street it appears quite small, yet within, the restaurant boasts two floors, various private booths and a large open dining hall at the back. Secondly, the neon lights and industrial-style decor will transport you back in time to the early 2000s when modern pizzerias reached a peak in popularity. Despite its sprawling layout, Frankie Gallo Cha Cha Cha’s maintains a perpetually energetic atmosphere – probably because so many people, tourists and locals alike, can be found dining there at all hours. 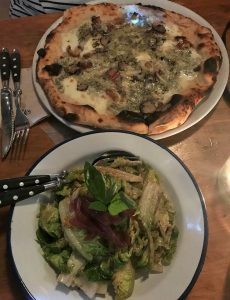 Even more unusual for a pizza restaurant, the clientele at Frankie Gallo Cha Cha Cha are a diverse mix representing a broad spectrum of society. Serious businessmen discussing their next deal may occupy a booth next to a raucous hen party from Liverpool. Skater-types, ubiquitous in the skateboarding Mecca of Barcelona, frequent this quirky restaurant along with families and couples on holidays. Drawing this colourful crowd in is of course the food, and in particular, the pizza. To create the perfect product, every step in the sourcing-cooking process has to be impeccable. As such, Frankie Gallo Cha Cha Cha’s pizzaiolos begin with unrefined organic flour from Padua to form the bases of their masterpieces. 72 hours is devoted to the slow fermentation of this product, after which it is ready for a swift 2 minutes baking in their stone oven. The result: a light, flavoursome sourdough base that is neither truly Roman nor Neapolitan but is definitely not to be missed. 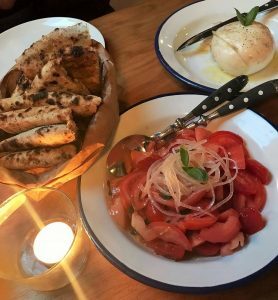 From such a high-class starting point, Frankie Gallo Cha Cha Cha maintain their commitment to quality by using fresh ingredients, sourced locally wherever possible, and from the motherland of Italy when necessary. The pizza menu is neatly divided into classics (tomato and mozzarella base); red (tomato base); and white (mozzarella base). Within these categories, you can find all your favourites, such as the simple basil and parmesan margherita, vegetarian-friendly parmigiana, and the ‘four cheese’ – consisting of scamorza, gorgonzola, parmesan and mozzarella. 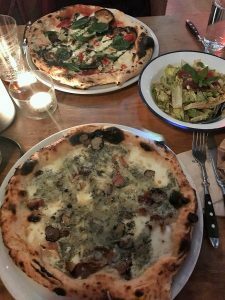 Frankie Gallo Cha Cha Cha love to experiment however, and it’s highly recommended to sample one of their special pizzas, including the rich truffle carbonara or the confit-lamb topped Pakistani Raval. Besides pizzas, the menu boasts various other tempting Italian specialties which serve as the perfect starter or accompaniment to your meal. Frankie Gallo Cha Cha Cha are able to smoke foodstuffs onsite and they create their own smoked mozzarella di bufala – an enormous serving of the most delicious mozzarella you will find. For those feeling guilty about their pizza, a refreshing seasonal tomato salad will put your mind at ease. Alternatively, their green salad is served with a sweet honey-based dressing and caramelised red onions. Buon Appetito!